Do Your Part to Help Japan | It's not your tech, it's how you use it. For a week now we’ve all been glued to the television – first watching the events unfold as northeast Japan was struck by a magnitude 9.0 earthquake last Friday, and then as the region reeled from the ensuing tsunami that swept over the Japanese coast immediately afterward, and then through the weekend up even through today as 50 brave workers struggle to keep the nuclear reactors under control at the Fukushima Daiichi nuclear plant. Meanwhile – and while much of the world’s attention is turned to the ongoing nuclear crisis at Fukushima, the rest of the world and the ongoing relief efforts are directly aimed at the coast of Miyagi Prefecture, including the tsunami ravaged cities of Sendai and Kesennuma, not to mention the isolated villages and areas farther Ray Ban outlet north that are still largely cut off from the rest of Japan. People there are still struggling to find missing friends and family, and are slowly returning to their homes and locales only to find utter devestation and destruction. Do your part to help – while a lot of people would argue that good thoughts, prayers, and spreading the word don’t do much to actually help people, but I would disagree – all of those things are positive, and especially spreading the word can get the message in the hands of someone who can more directly help, which is definitely a good thing. So spread the word regardless of whether you can donate, and if you can donate, click the link above at the top of the page in red to Donate to the Red Cross, text “REDCROSS” (without quotes) to 90999, or consider one of the other charities at the Google Crisis Response page. While you’re there – pass along that link as well so people looking for friends and loved ones can use the Google Person Locator to help find them. Even indirect donations work wonders: retailers like ThinkGeek have donated generously, LivingSocial says that for every $5 you donate that they’ll double it, and importer of all things geeky and Otaku J-List promises that 5% of all its sales go to the Japanese Red Cross. Alternatively, you can consider this gorgeous Help Japan t-shirt, where the artist and printer who designed it promises that all profits from the pre-orders of the shirt will go to Save the Children. If you’re looking for some classy art for your walls, you know, the kind you plan to hang up in style, designer Kelly Beall of Design Crush has some beautiful prints (one of which is shown above and another below) that you can buy for your home – all proceeds go to the relief effort. Head below the jump to see a very Gafas Ray Ban outlet special message from a very special person: actor George Takei – in a video that expresses the importance of donating if you can, and spreading the word if you can’t. images in this post courtesy of Design Crush, where prints for charity are linked for sale, rights reserved by their creators. 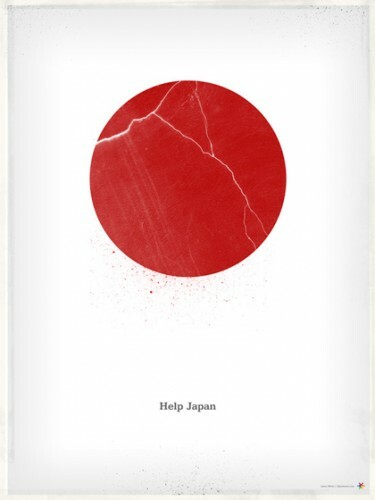 The first image is Help Japan by W+K Studios, and the latter image is Help Japan by James White.